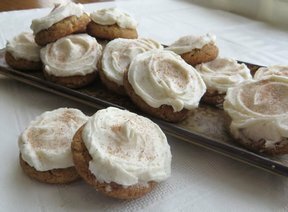 With coffee flavoring in the cookie and Irish cream in the frosting you can enjoy the flavor of Irish Coffee in a cookie. Served with a hot cup of coffee or a cold glass of milk, these scrumptious little cookies make the perfect treat for both young and old on St. Patrick's Day or any day throughout the year. Learn more about the customs and beliefs that are associated with St. Patrick's Day and the traditions that are celebrated. Irish soda bread is a quick bread that is a traditional part of the Irish cuisine. See our guide to making quick bread for helpful information.